﻿﻿﻿﻿Pondering on where to go next with my blog, I've decided to start a "off the week" style post. Obviously a lot of these can be seen in many fashion blogs, but with this showing no relation to what I post about, the idea of Adverts of the week came into my head, so once a week I will be babbling on about some interesting adverts I've seen over the week, whether they be fairly recent advertisements or something I've found browsing the internet. Todays will feature a comical advert from Taco Bell and an advert showing insight into the Xbox One. Enjoy! While browsing the web I found this advert from the fast food giants Taco Bell. This is an American based commercial that is promoting their power protein menu, using humour and some celebrity endorsement. The main reason this caught my eye was purely the fact it was hilarious, obviously not having Taco Bells in the UK, the advertisement was not shown on TV, but because it also went viral, I've came across it a few times and I'm bad laughing every time! 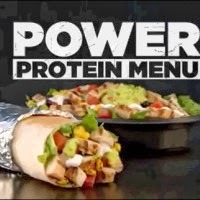 Taco Bell are utilising the market with this product, with a large amount of people focusing upon eating more healthy, and more males wanting to get "bigger", hence the emphasis on the protein, and the word "POWER". Yes I know I got on about the next generation consoles a lot , but their release dates are just around the corner and I'm still undecided on which product to buy. The second advertisement that caught my eye this week was the Xbox Ones. Up until this advert, I was still unaware of the reasons for the name of Microsoft's new console, but as you can see from this short advert, Microsoft have tried to make an "all-in-one" system which allows you to do anything and everything, turning your tv into a smart TV, with voice activation and hands-free features, what else could was ask for? People such as Steven Gerard and Spock star in this 1:40 minute commercial, which shows both the features of the new console and some of their exclusive games.